Huntington’s east end today. The $15.1 million dollars Explorer Academy is in its second year of existence, but parents and teachers both agree the newly renovated building that will house the experimental learning program will only continue to expand the educational opportunities for their students. The academy, which uses a new teaching philosophy called expeditionary learning, will now be housed in a fully renovated Beverly Hills Middle School after spending its first year crammed into Geneva Kent Elementary School. Expeditionary Learning is a unique and new model of learning adopted in Cabell County when its Board of Education chose to consolidate Peyton and Geneva Kent Elementary Schools. In conjunction with the Marshall University Harless Center, the Explorer Academy was the first to take on Expeditionary Learning in the state. EL as it’s known, is a learning model that veers away from the tradition of students sitting behind desks listening to lectures. 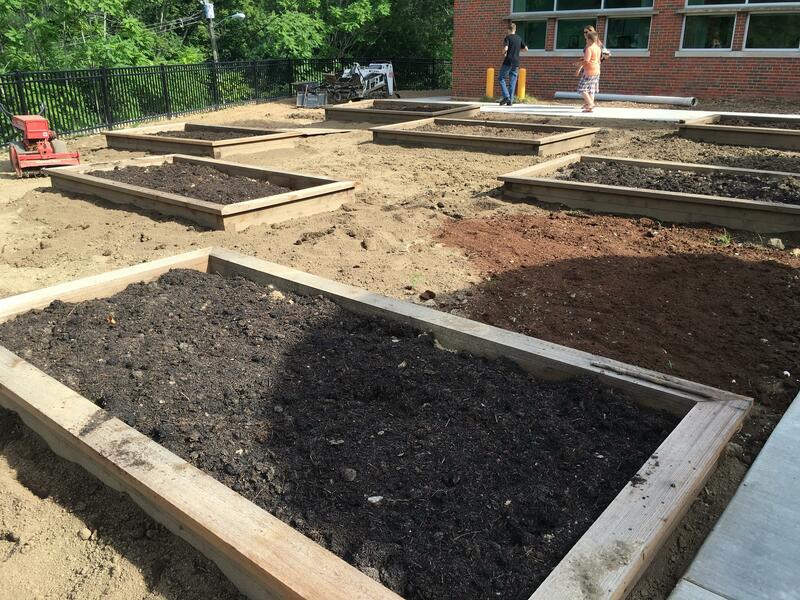 Instead, students work on year-long, hands-on projects across grade levels. Special education teacher Jason Dillon said under the Expeditionary Learning Model, teachers are more like moderators than instructors. "Traditionally speaking classroom teachers were the masters of everything, here we embrace that we’re not the master of any of that," Dillon said. "But we know masters and we’re going to bring them in and have them work with you. We facilitate professionals coming into our building and just try to coordinate the chaos." Brittany Hicks is a third grade teacher at the school. She said aside from just new and innovative learning models, her students are also asked to analyze their learning progression and communicate that with their parents during student-led conferences, even as young as the second grade. 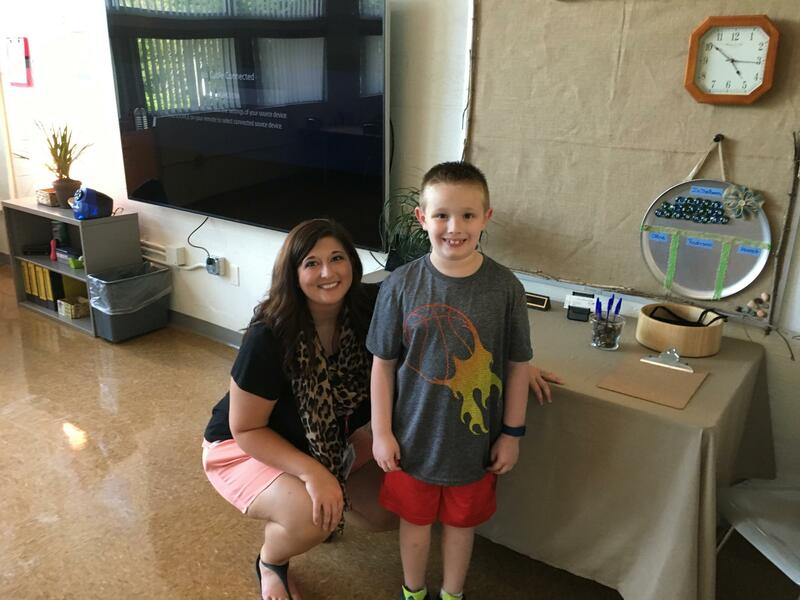 Third grade teacher Brittany Hicks with Carson Elkins. "I welcome the parents into the room and the students take over," Hicks said. "They have portfolios where they get all of their high quality work that they’re really proud of, they organize it in binders and have these conferences with their parents and discuss their data, so where they started at the beginning of the year, where they are now with their benchmarks and they talk about what they feel like got them there and what they need to help them get where they want by the end of the year." Those different and unique ways of teaching kept Mark Brown and his wife from leaving West Virginia. They both work in Kentucky, but after hearing about the Explorer Academy, decided to keep their son Nathan in the school district. He’s entering the second grade. "In a traditional school you sit in a class and get lectured to, you take a test and then you go onto the next thing," Brown said. "But here they’ll work on something and turn in a draft and get it critiqued by the teacher and you learn how to be, agreeable disagree if you need to do that, like most people can’t do now. And then you work on it and turn it back in and do that several times," Brown said. 450 elementary students will experience that learning style in the renovated facility. Principal Ryan McKenzie said while the first year of the academy in the consolidated space worked, the new school will provide things they didn’t have before like large spaces that allow cross-mingling, creative learning environments that are crucial. 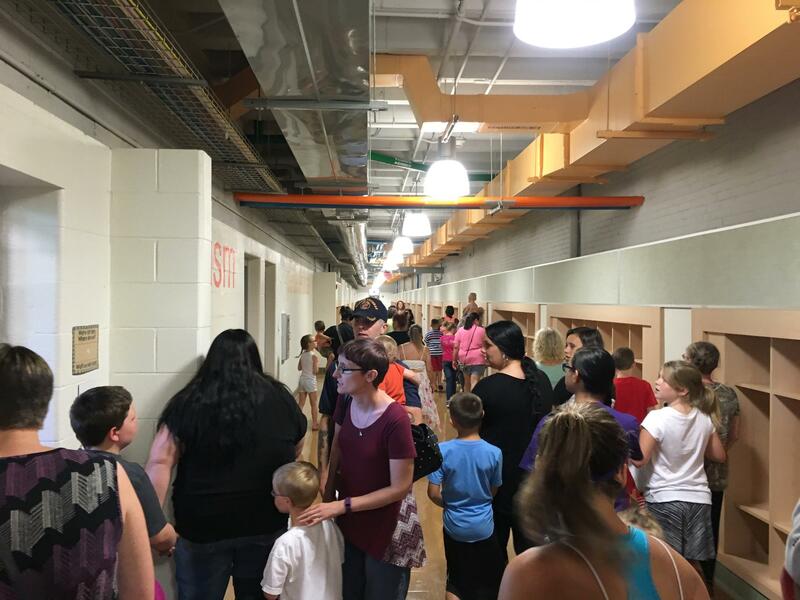 "We have a lot of flexible use spaces here in the building, some studio spaces that we can use, we have a great art room, great music rooms and dedicated science labs, so really great facilities here to work with kids," McKenzie said. Some Cabell County students took part in their first full day of classes Monday at the Explorer Academy. It’s the first Expeditionary Learning School in the state of West Virginia. It’s an undertaking of the Cabell County School Board. Peyton Elementary and Geneva Kent Elementary were closed and consolidated to form the academy. The Cabell County Board of Education has voted unanimously to approve 61 layoffs and 97 transfers for professional and service personnel. The Herald-Dispatch reports during a meeting Tuesday, board members approved 48 reductions in force, or RIFs, and 83 transfers of professional personnel. The board also approved 13 RIFs and 14 transfers of service personnel. The Cabell County Board of Education will consider several personnel layoffs and transfers at a special meeting. The Herald-Dispatch reports board members will vote Tuesday on a list of 48 reductions in force, or RIFs, and over 55 transfers of professional personnel. Cabell County School officials kicked-off a new free meals program for students Tuesday by announcing all Huntington High School students will receive free breakfast and lunch starting Wednesday. Six-foot-long stop arms on school buses haven't deterred some drivers from trying to illegally pass. Kanawha County Schools executive transportation director Brette Farley tells The Charleston Gazette-Mail that the new stop arms have been hit six times since the school year began in August. In Cabell County, schools transportation director Joe Meadows says one driver hit an arm.